Motorola DROID RAZR is the thinnest and one of the most powerful mobile phone in all time history today gets a white sister. 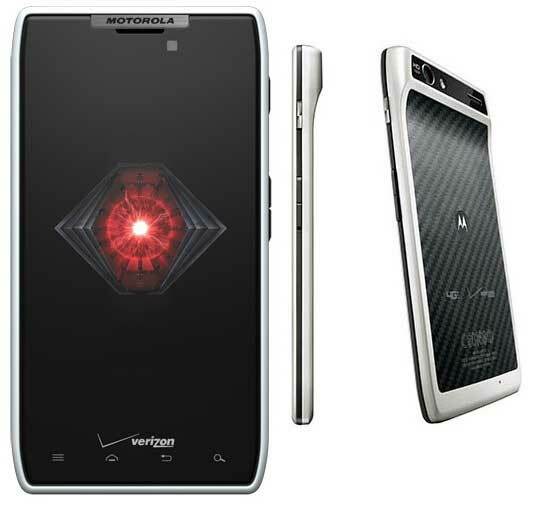 Verizon offers white framed DROID RAZR from today. It is available in stores and online for $299.99, which is same as black brother. There’s nothing more to say, if you are interested then take a look at the PR. In the meantime Samsung Galaxy Nexus is also released just 10 days before Christmas 2011. So the Verizon cell phone lineup is just great for this holiday season. They have Ice Cream Sandwich running Galaxy Nexus along with DROID RAZR and HTC Rezound. OH yes! iPhone 4S too! Just in time for the holidays, the DROID RAZR™ by Motorola in White will be available on Dec. 15 at Verizon Wireless Communications Stores and online at www.verizonwireless.com. Customers can purchase the DROID RAZR in the new color for $299.99 with a new two-year customer agreement. Additionally, for a limited time only, customers can take advantage of a special promotion and receive $100 off a DROID XYBOARD tablet with the purchase of a white DROID RAZR with a new two-year customer agreement. Customers that purchase a DROID RAZR will need to subscribe to a Verizon Wireless Nationwide Talk plan beginning at $39.99 monthly access and a smartphone data package starting at $30 monthly access for 2 GB of data. The DROID RAZR not only shreds through the Web at blazing 4G LTE speeds, it does it in style with a 4.3-inch Super AMOLED™ Advanced display, measuring 7.1 mm thin. The DROID RAZR is also packed with brains and security giving customers apps like MotoCast™ and features like remote wipe, pin lock and government-grade encryption for email, calendar and contacts.